In my previous post I mentioned the new social network for aviators, myTransponder. Although, I have met pilots from all over the country through the site I noticed there was an abundance of Midwest based pilots on myTransponder. About a month ago I decided it would be fun to meet the Midwest pilots in person. 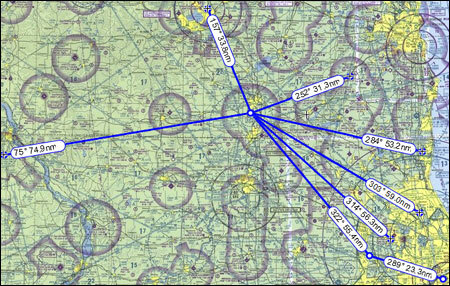 I used the myTransponder "Events" functionality to schedule a fly-in for Janesville, WI as it seemed to be centrally located for many of the pilots. 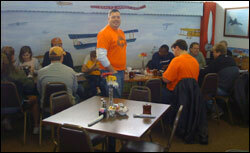 Janesville also has a restaurant on the tarmac, Kealy's Kafe where we could enjoy a good meal among pilots. I was delighted that moments after scheduling the event several pilots had already replied that they were planning to attend. My only concern was if the weather would cooperate. Sure enough the date arrived and the weather worked out in our favor. I was joined by my friend and AOPA Project Pilot Mentee, Peter. We had a nice smooth flight to Janesville that took just over 40 minutes. The only difficulty on the flight was that the Bendix Traffic Advisory system was malfunctioning and giving us incorrect warnings indicating there was airplane traffic right below us. We ended up turning off the system for much of the flight as it is very nerve wracking hearing that alarm go off in your headset even though we were confident the system was incorrect. When we arrived at Janesville I recognized the White Cherokee that belonged to Robbie one of the myTransponder members. He had flown in from Waukegan (KUGN) and was joined by his four year old son who seemed to enjoy the flight in. We reserved a table for seven figuring we would be lucky if that many people ended up actually attending. I was amazed when more and more people started to arrive. In all we had 15 people that flew in from three different states and seven different airports. Several blogs, podcasts and aviation websites were represented at the event including, myTransponder, Jetwhine, Flying in Chicago, Pilotcast and of course MyFlightBlog.com. We had an enjoyable meal and conversation. Special thanks to Rod from myTransponder for picking up the check. After breakfast we checked out a few of the planes on the tarmac. 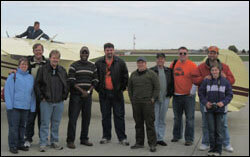 Those that had not yet departed posed for a photo in front of Greg Bockelman's beautiful Cessna 195. While we preflighted the Cessna for the return trip Peter decided to wipe down the Bendix antenna to see if that would fix the false traffic alerts. Sure enough it did. I have made a mental note to add checking that the antenna is not just securely attached but also clean during future pre-flight checks. The flight back was as smooth as the flight there. We arrived back to a busy Chicago Executive Airport where we made another smooth touchdown. It was fun flying with Peter and great meeting all those fellow pilots. I am looking forward to our next fly-in! Thank you for this excellent report. Despite being a myTransponder member, I could not join - mostly because I'm on the other side of the Atlantic ocean. Sounds like a nice fly-in... I can't wait to participate in some once I'm fully certificated! Steve - Thanks for the comment on MyFlightBlog.com. Just checked out your blog. I love the title "A mile of runway will take you anywhere". I added you to my blogroll and google reader. Good luck with preparing for the checkride!